A huge statue of Shiva with Nandi - Pradosham is celebrated in a grand manner. The Cultural Exhibition is one of its kind and has the great epics Ramayana, Mahabharata, Krishna Leela and Sri Sankaracharya Charitram depicted in the form of animated dolls. Craftsmen from North India were specially engaged to create this marvel, which showcases our epics in an innovative way, attractive to both the young and elders. A photo gallery containing a vast collection of the pictures of Pujyasri Chandrasekhrendra Saraswathi Mahaswamiji, Pujyasri Jayendra Saraswathi Sankaracharya Swamiji and Pujyasri Sankara Vijayendra Saraswathi Sankaracharya Swamiji. A separate wing contains a collection of musical instruments from all over the country. With all these wonderful collections under a single roof, a visitor to Kanchi must make it a point to visit this centre at Vedal. 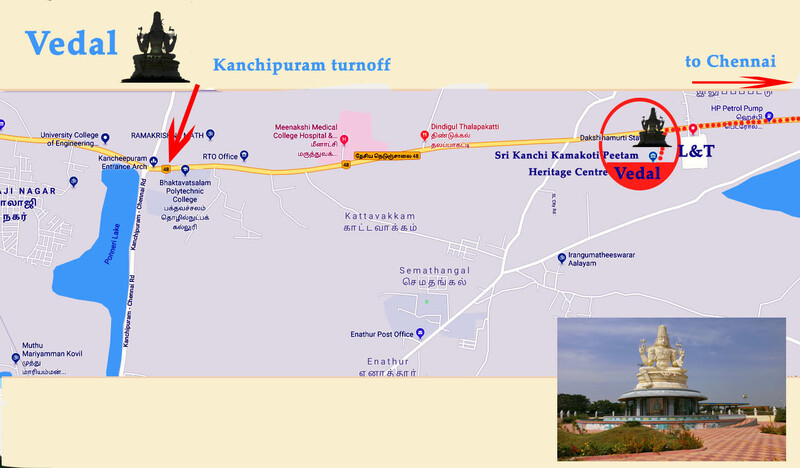 The centre is located at Vedal, on the National Highway 4 connecting Chennai and Bangalore, and just before the lane to Enathur and 4 kms before the lane to Kanchipuram(while travelling from Chennai). There is an L& T engineering unit just before the centre and a Bharat Petroleum Pump just after the centre. The centre is open from 7.30 am to 6.30 pm.. Ample parking space is available (even for buses). Tourists can plan to visit this centre especially during the temple break timings in the afternoon (12 pm to 4 pm).